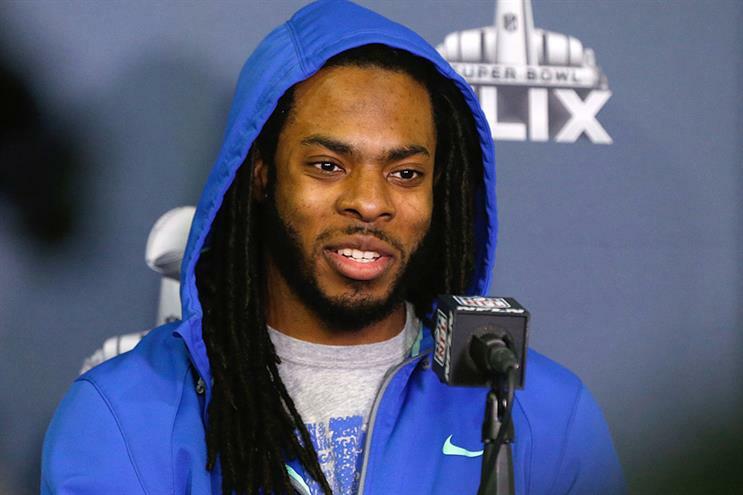 Seattle Seahawks cornerback Richard Sherman (via the NFL's Twitter account). Marketers looking to take advantage of Super Bowl XLIX on Sunday have another thing going for them — other than a potential record TV audience, of course — the well-known players and coaches on both the New England Patriots and the Seattle Seahawks. The NFL’s championship game will feature teams from large media markets on both coasts, notes Jason Teitler, chair of Burson-Marsteller’s Fan Experience group. Yet more importantly, each team has players who transcend sports and stimulate significant media attention, which is why it’s important for brands to be nimble and play off those personalities with their own customized content. Patriots quarterback Tom Brady, who is going for his fourth Super Bowl ring in six tries, "has very much been perceived as a good American sports hero" known both among fans and sports neophytes for deals with major brands such as Under Armour and Ugg. And it hasn’t hurt Brady’s reputation that he’s married to supermodel Gisele Bundchen. Yet one caveat for brands this year is the controversy surrounding Brady and the Patriots after reports surfaced that the footballs the team used in its 45-7 win over the Indianapolis Colts in the AFC Championship were underinflated. Balls that are inflated at a less-than-standard rate are easier to catch, throw, and carry without fumbling. Both Brady and Patriots coach Bill Belichick held press conferences last week denying they knew anything about how the footballs became underinflated. On Thursday, Brady did a press conference in which he stated, "I would never break the rules." Belichick spoke to the press again on Saturday afternoon, saying the team investigated the matter and describing various scientific reasons that could have taken some air out of the footballs. The NFL’s investigation into the issue found that 11 of the Patriots' 12 game balls were inflated below the league’s requirements, according to numerous reports. Shawn McBride, EVP of sports for Ketchum Sports and Entertainment, says the "dark cloud" hanging over the Patriots could go away depending on the NFL’s decision in the coming days. "If this controversy doesn’t get totally resolved and lingers into the post-Super Bowl timeframe, that will be a consideration for marketers as to who and to what extent they may want to affiliate with certain players on the Patriots," he explains. Seahawks quarterback Russell Wilson is another marquee player who brand marketers should pay attention to before and during the game, says Teitler. Wilson is "wholesome" and is going into the big game as a defending champion against one of the best teams of the last decade, which will provide marketers with great stories, he adds. Both quarterbacks will have starring roles in the game, but they differ significantly in their endorsement strategy, says McBride. Wilson has "a very full roster of endorsements," he adds, so much so that the Seahawks asked him to limit his number of brand deals last October. He’s served as a spokesman for companies including Pepsi, Nike, Microsoft, Bose, Alaska Airlines, and Braun. Brady, meanwhile, is more selective about what brands he affiliates himself with, notes McBride. With both quarterbacks, McBride says "maybe there’s not a big play for them from a marketing or advertising perspective," which could open up the field for brands to look at up-and-coming athletes or players with strong personalities. For instance, Patriot tight end Rob Gronkowski has received more media coverage in recent months, even making the cover of ESPN, the Magazine last month, notes McBride. Bret Werner, SVP and MD at Catalyst, agrees that brands and marketers should keep their eyes on emerging players, especially after seeing how much Seattle cornerback Richard Sherman raised his profile in the past year. He adds that some players might emerge on Super Bowl media day on Tuesday, so marketers and more specifically PR pros should keep an eye on that event. Though one of the game’s most high-profile players, Seahawks running back Marshawn Lynch has "a reluctant relationship with the media," notes McBride, but also a well-known love of Skittles. Even if Sherman is quieter than last year, Teitler says brands can take advantage of the storyline that both he and Patriots cornerback Darrelle Revis are very outspoken, making them an "interesting duo" around which brands can customize communications. Another potential storyline is the intriguing dichotomy between Patriots coach Bill Belichick and Seahawks counterpart Pete Carroll, himself a former New England coach, notes McBride. Belichick is an accomplished Super Bowl-winning coach, but he’s been hesitant to become involved in any kind of marketing. Carroll, on the other hand, "has a very dynamic personality" and does a lot of speaking events, he adds. While he has no national endorsements, that could change quickly if Seattle wins back-to-back championships, McBride explains. Aside from the players and coaches, Werner advises brands to look at non-traditional people around the Super Bowl who can be incorporated into communications. Whether it’s a wife of a player, a fan, an alumnus of one of the teams, a celebrity, or even a sports blogger, Werner said "there’s always a personality off the field." Click the image below for Campaign's latest Super Bowl coverage. In brief: Stunning Facebook ad format; is Apple building a car? In brief: Super Bowl, Super Bowl, Super Bowl!